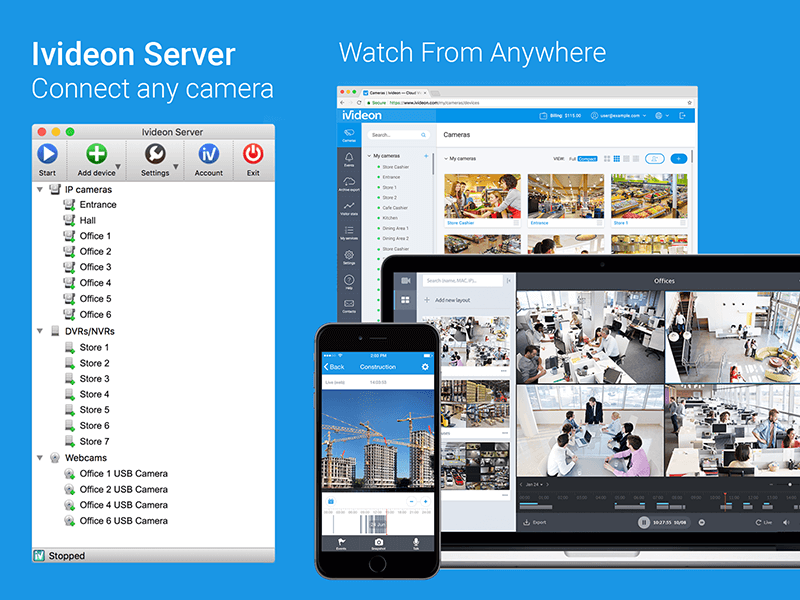 A powerful solution for video surveillance, remote video monitoring, and video recording for security cameras, DVRs, and NVRs.Ivideon is easy to use, set up, maintain and scale for business and home no matter how many locations you have. It can easily cope with any number of cameras.It lets you keep tabs on things while you\'re away, with event notifications and recordings stored either locally or in the Ivideon cloud.Ivideon easily supports both single and multiple locations. It tracks what matters most to you, no matter where you are. It keeps you updated on important events in real time and stores those events in the cloud for easy access.Ivideon\'s video-surveillance service is scalable, simple, and reliable. From a webcam monitoring a home to an IP-camera network serving an international business, Ivideon can handle it.Every day, more than 2,000,000 individuals and businesses use Ivideon to:* access high-quality video online (with sound) through any standard connected device including iPhone, iPad, Mac* record and store video in the cloud with guaranteed reliability and data security* receive automatic push- and e-mail notifications of suspicious movements or sounds* quickly search and view recorded surveillance video* access quality video over any bandwidth down to 3G* easily expand to any number of cameras* share camera access with PTZ, Archive, and Live options* transfer and store data securely* embed surveillance feeds in websites or blogs* share camera links over social networks* search video events linked to POS, access control, and home automation systemsIvideon is safe. Ivideon is simple to install and maintain. And Ivideon is accessible from anywhere - but with all the functionality of more expensive and complex solutions.And if you get stuck, our help desk is ready 24/7. The Simkl IM CVR software can record all voice communication including Skype-to-Skype, SkypeOut, SkypeIn, group calls, and video calls. Backup all of your history to the secure remote servers. You can have access from any places of the world. Webcam Recorder records webcams to AVI files and watch them whenever you want. Work with AOL Instant Messenger. Audio can be recorded from any source. Webcam Recorder can record anything which can be displayed on your screen. Winpopup lan messenger offers real-time messages exchange that is ideal for the office or for university students, or home-LAN clients. Instant messaging has never been easier to configure and use.